As a boy, my one true love . . . was basketball. That’s right. Like Juliet to Romeo, basketball was the sun, only . . . okay, well, that may be stretching it a bit. But the idea of playing, the feeling I got from being on the hardwood or the blacktop found its way into every corner of my brain, it climbed beneath my skin, so all I thought about was shooting hoops. Now, I was a skinny kid with asthma who couldn’t run fast, couldn’t jump high. So, you know, me and basketball were the perfect match. I loved playing basketball so much, I spent every day, rain or shine, shooting, dribbling, running, jumping rope, trying to get better. I sought out coaches I respected and asked them for drills. And they shared them with me, even though I didn’t play for them. That struck me as quite generous. It was that way all through high school, too. The summer between my junior and senior year, I averaged 10+ hours of basketball every day. I played in a park about six miles from my home. It took me an hour to walk there every day after driver’s education, dribbling my ball, stopping at two other courts along the way for some practice shots, maybe a few games of one-on-one. I won’t go into the whole story, not here, but suffice it to say, my dream was to play Division I basketball at UNC. Syracuse would have been my second choice and Virgina third (James Worthy, Louie Orr, Ralph Sampson were all playing back in those days). I spent all my energy chasing that dream and, even in retrospect, those were the best days in my young life. I spent every minute I could doing the thing I loved. I lived the thing I loved. I was the thing I loved. Life doesn’t get much better than that. Just after the season started during my senior year, I blocked a shot in practice and came down on a teammate’s foot, snapping my ankle. My season was over. I worked hard to rehab, hoped that if I gave myself time during my first year in college to fully recover, I could try out for the team as a sophomore. But as Robert Frost put it, way leads on to way. Over the years, my dreams have changed. I wouldn’t say they’ve been abandoned, as much as that they morphed. Other interests rose up. Of course, for much of my life I didn’t listen to those interests, not beyond having some deep down feeling in my gut. I think that’s true of many of us. We get swept up in the whole way leading on to way and, for some of us, we forget to listen. We stop listening for any number of reasons. But it’s important to listen. I think that’s where happiness lives, in the listening, and in the doing . . . in both. It took me decades before I heard that voice inside letting me know that I had a new love, a new passion. There was this completely different thing I never expected that filled me with the same kind of feelings I got from playing ball (and i did it most days without getting sweat in my eyes). You’re here because you’re a creative – a writer, or a painter, or a singer, or a photographer, or a gardener, or a mixed media artist, or . . . You’ve already done some listening. On Fridays we tend to look back on the week, or further, and reflect on the action steps we took related not just to our goals, but to our intentions. What things did we do to honor that voice deep down inside us? Some weeks we may do more than others. Some weeks we may find ourselves on a different path entirely. That’s the importance of listening. Of paying attention. Sometimes our dreams change. And that’s not necessarily bad or good. You have to decide – by listening . . . Sometimes an obstacle arises that is painful, that keeps us from our goals, from our dreams for a time. But those are the times we learn about ourselves . . . if we listen. We learn different paths to those dreams, or we learn those dreams may have only been part of our story. That is why understanding our intentions is so important. Why listening . . . to our hearts, to our souls is so important. The photo at the top is titled “Listen With Heart” and it claims that a true friend listens with the heart. Sometimes we forget to be a true friend to ourselves. That’s all we’re suggesting now. Take a few moments today and be still. Take a few deep breaths and listen. What is your heart telling you? Your soul? What is your dream? And what steps have you taken toward it? If you haven’t taken any, well, that happens. But let’s not except that as the only outcome. After all, you just listened and that’s a step. Now answer this – what is the first step or the next step you will take? 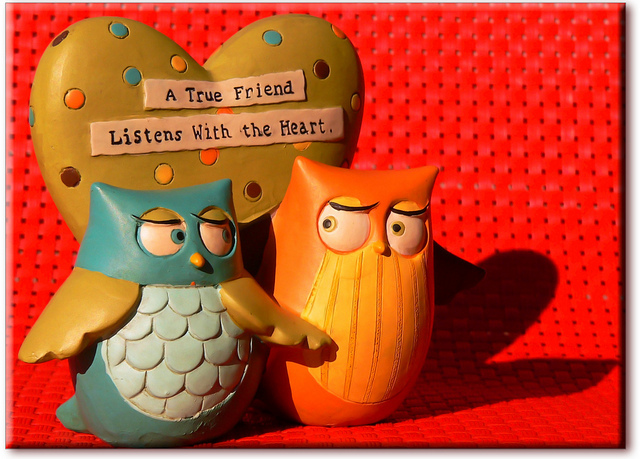 Photo Credit: “Listen With Heart” by Len Matthews photo above is used as per Creative Commons License on Flickr.